There is a serious bug from new macOS update(High Sierra). Korean characters break apart when I type into text directly into text window. It may not be your fault, but please check it out. Can you provide me with a screenshot comparison of what Affinity is doing compared to what another app is displaying? Also, what font are you using and can you provide me with a sample document? I've just compared some Korean text in Affinity on High Sierra to Sierra and to me it looks the same so I'd appreciate any further info, thanks! I don't update High Sierra( because I heard this error happen : Korean input method with Affinity Designer). You can see that error using below step. 1. Just switch input method to "Korean input method( 2-set Korean)". 2. type g k s r m f in keyboard. 3. that show ㅎㅏㄱㅡㄹ (Wrong Korean word). 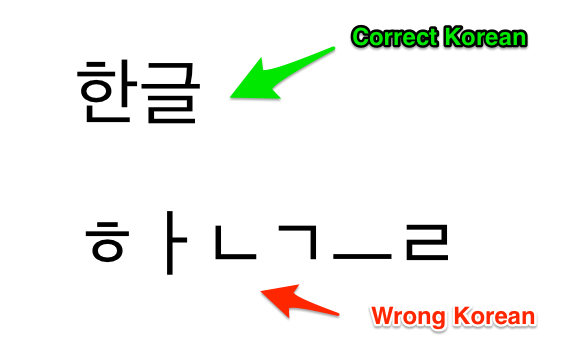 But that should show like 한글 (Correct Korean word). You can compare that method in Notes app. Just add correct n worong result screen shot. That's extremely helpful - thank you. I'll get this passed over to the dev team. I am experiencing the same issue with Affinity Designer 1.6 (which I updated yesterday), subsequent to a concurrent update of High Sierra to 10.13.2 beta (17C60c), so I don't know if this is due to Mac OS or Affinity Designer 1.6. 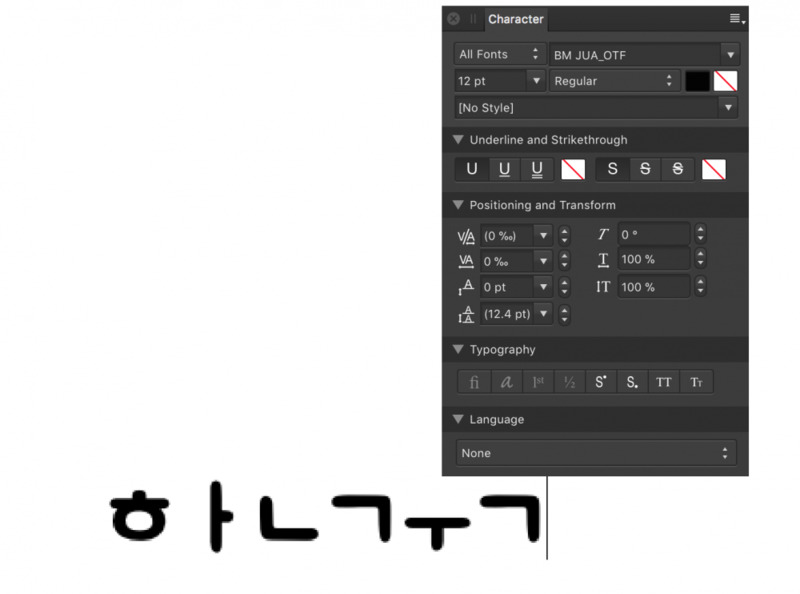 I tend to think the issue lies with Affinity Designer 1.6, inasmuch as Korean text input still works perfectly in all other applications. But I don't have 1.5.1 to compare against anymore. I hope we can work out a fix quickly. I've got some work to do that requires Korean text. Is there a download link for the older version? Unfortunately not with how the Mac App Store works. I believe if you have a Time Machine backup it should be possible. The bug has been logged with dev so hopefully we can see a resolution soon. If you go to Text > Show Character > Language > None and then type, this should work. We haven't found a fix for the program, but this is the current workaround. Once you have set it to None you can change it back to whatever you want and it should continue to work. but I hope the fundemental fix for the program. Thank you, Chris B and the Dev. Yeah there is clearly an issue but I'm glad that worked for you. Thanks for being so patient. I still have same issue, even though I have changed setting above. Font is the serious issue for me. getting really disappointed. 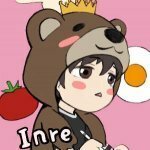 Are you using 2-set Korean input? I assume you've tried using other fonts too? Yes I am using 2-set Korean input. I have tried several font that I had used before update. still get same issue. I love this Affinity apps, however without typing words, it is really useless to me. Please solve this issue for me. In Preferences > Keyboard > Input Sources > 2-Set Korean, what is your Input format set to? Mine is using Hanja (Hangul) though I'm not sure if this makes a difference. I can't test changing this myself as once I set my Language to None, the text connects correctly and is no longer separated. I understand that this is a crucial part of the app. I have no intention of giving up on this. Something has clearly changed with us so we need to figure out what. I have changed hanja to another 2 types setting and tried to setting None to English and Korea. Still has same issue. just tried. I've tried all the tricks ahead, but it won't work. The problem with Hangul remains, and the latest update is not solved, despite the fact that the latest update is underway. Consistently isolated, which is normally released at any moment. I can't tell you how it works. I think there should be fundemental solution. I have to set again whenever I log in. and it doesn’t guarantee that typing in Korean without any problem works. I really love the Affinity Photo, but typing problem is very serious problem since it bothers my works. Thanks for the video @plusopen. I've sent this over to development. @Asteya I've also updated the bug report with your feedback. We were sure once it started working again, it would remain that way. I've left it with development and hope to get some feedback soon so I'll let you know. Chances are it could be a High Sierra bug too which may eventually sort itself out. Can you all confirm your OS please? my mac version is 10.13.2 High Sierra. I am currently working in Apple related jobs. where Sierra is installed, the Korean alphabet is normally entered. My OS is High Sierra (10.13.2). It worked fine when I used Sierra. It all started when I updated to High Sierra. Thanks @plusopen and @Asteya that's actually really helpful to know. It might be worth reporting this to Apple if it hasn't been already. I'll update dev. i wonder, whether this is major problem. it has been issued about more than 2 month, nothing has been fixed. wondering, dev team is working or not. I have the same issue as well Hope this can be fixed ASAP, copying and pasting the texts every time is really annoying.. I was using OS 10.12. Affinity Design 1.6 with basic Korean Input method. There is Korean Input problem. In 1.6 version, if you using Gureum Korean OS X input method http://gureum.io/ you can input Korean without the problem. Affinity Desing 1.6.1(rc1) with basic Korean Input method. That Korean Input bug is gone, you can input Korean without any problem.